Salvation And Survival: My Concealed Carry Problem Is Solved! My Concealed Carry Problem Is Solved! Whether you are a woman, like me, who has been struggling to find the perfect method of carrying a concealed weapon, or you are the husband who is looking for a way to encourage his wife to carry concealed, I think I have found the best solution to date. It's the Smith & Wesson M&P Shield. This 9mm pistol has received lots of glowing reviews from men, but I want to tell you --- woman-to-woman --- how it meets my needs. In the past I've shared my journey of gun ownership and training. I started with the Springfield XD 9mm as my first range pistol. I graduated to the Glock 19 and then to the Baby Glock, hoping that this compact gun would allow me to carry concealed. These handguns would work if I wanted to use a concealed carry purse. But I had decided that this option would not be my primary choice for different reasons: 1) I didn't like the idea that my defensive weapon was not on my person. 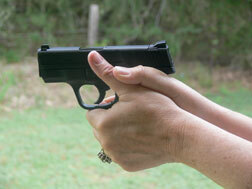 I have trained with my handgun in a range holster and liked the feel of it in that position. 2) I didn't want to have to worry about someone taking my purse away from me during a struggle, or 3) stealing the purse while I was distracted. But the Glock 26 was still too big and I could not effectively find a way to hide the fact that I was carrying. Then I heard about the Shield, did my research and saw all the photos that compared its width to all the compact guns on the market. It looked like it just might be the answer to my problem. Then I held one in my hand and the difference was phenomenal! I know it wasn't, but it feels like it was made for a woman's hand. The width measures less than an inch and it weighs in at 19 ounces, making it considerably lighter than any other option. I made up my mind that this was the handgun I wanted. Then came the wait. It has become one of the most popular handguns in the country and the waiting list at gun stores is getting longer by the day. After pre-paying and being promised that it would probably be 3-4 weeks before I received my purchase, you can imagine my frustration when that time frame turned into 2 1/2 months. I then lucked into a family-owned store that was able to get me the firearm in less than a week. So if you decide to go this route, be prepared to be more patient than I was. I had increased the level of my training, and it was time to get down to business and find the right carry gun. That happened with the Shield. Then came the ultimate tests: training with the gun and actually carrying it. The Shield passed the first test with great results. I put close to 150 rounds through the chamber that first day and had only one jam, probably due to my limp-wristing it as I grew accustomed to the recoil. I was most impressed with the trigger pull, which felt the same as my Glock 26, which I love. The Shield has a good, short reset; very distinctive -- you can feel it and hear it, making "catching the link" easy. The recoil was less than I expected, only slightly more than my Baby Glock, and it won't take long to adjust to. I found that the slide lock is further back than you would think, so you ladies will need to work on acquiring the skill to overcome the tight spring. But it is definitely within your grasp. I really liked the magazine release. It drops fast and smooth. The single stack mags are available in both 7 and 8 round capacities, and I recommend stocking up on as many as you can find. Get ready to put your name on a waiting list for them, too. The real test came when I wore it concealed. For me and my body type, I found that it is most comfortable to carry appendix-style in an inside-the-waistband Comp-Tac holster. I wore it all day, both while driving in the car and running errands. While it felt a little foreign at first, it literally took just minutes for me to feel comfortable with it in place. I was sure that everyone I came in contact with knew I was carrying, and thought everyone could see the imprint of the handgun. But my husband assured me that no one would think I was carrying and therefore wouldn't be looking for it and could not see it. I was conscious of my responsibility and privilege as a concealed-carry holder, and thrilled that I could safely and comfortably protect myself. Granted, this method of carrying will not work with my entire wardrobe, but I now know that I can dress around it and there is an option for me. I know that when you carry small guns you give up something --- either firepower, round capacity, or accuracy --- but I have to say that the Shield minimizes all these shortcomings. It truly fills the gap between the "pocket gun" and all their problems, and compact guns like the Glock 26. And with the Shield, you get a striker-fired gun with a good trigger reset that costs half the price of comparable "slim" models like the Kahr PM 9. The only thing that I want on this gun and that I can't get is after-market night sights, made specifically for this gun. But I've waited this long to come this close to my perfect carry gun, so I can wait a little longer. After all, I need to work on that whole "patience is a virtue" area of my life. Psalm 33:20 "We wait in hope for the Lord; He is our help and our shield." I've been waiting to buy the XDS .45 as my concealed carry. However, when I went to look at it, a friend at the gun counter tried to talk me in to buying the Shield. I still am unsure which to buy. I particularly like the sights on the XDS. What do the after-market sights look like for the shield? The after-market sights for the Shield aren't technically available yet. Trijicon HD series fits the gun, but they're not technically made for that gun, so I'm going to wait for the sights made specifically for the Shield. I own an XD and like it, but the trigger pull is way out there, and I like the shorter reset on the Shield. Shorter reset = faster follow-up shots. 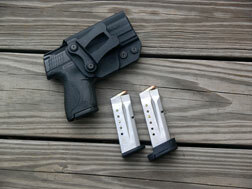 If you like the XDS, why not try it in a 9mm? I'm not sure if you're male or female, but if you're a woman, I would not recommend the .45...... a lot of recoil. Good luck! Great review. I look out for firearms reviews from women because they often look from perspectives that men don't consider. Like all things in life, the picture is better when male and female interpretations are brought together. Reading your post, I thought, "Gee, wouldn't this be a great present for #1 Jinni's graduation..." And exactly as you say, they are HARD to find. There is exactly ONE listed on GunAuction.com, and it's already at $560 with 11+ days to go and 57 bids. Have you fired the Ruger LCP or LC9? Do you have any compartive thoughts between the Shield and those pistols? OK, here's my thoughts on the Ruger models ..... both have long trigger pulls, the LCP's recoil is terrible and it is not a striker-fired pistol (double action trigger pull all the time). So neither is optimum for a woman. If you can't get a Shield, you might take a look at the subcompact M&P series or the Glock 26. Both are double stack vs. the single stack on the Shield, so they are a little wider gun. I have the Glock 26 and love it, (and PLW loves the fire power of his) but it's still too big for me to carry concealed on my person. That's why I waited so long for the Shield. Another possible avenue for #1 Jinni would be the Kahr PM9. It's a bit pricey, but she's worth it, right? It's very well made and while it does have a double action trigger, it's so smooth it doesn't feel like one. Good luck! Belle -- May I also recommend the Taurus 738 TCP in .380 as another viable alternative for a lady's carry piece? My wife has both the M&P Shield and the Taurus 738, and she loves both. Everything you've said about the Shield is true, so I needn't elaborate on it any more. The Taurus is even smaller, which would normally raise a red flag for me, as small guns are harder to shoot well than larger ones, but the 738 does a great job. Weighing in at just 10.2 ounces, it carries 6 + 1 rounds of the lower-recoiling .380. Load it with a good quality defensive round and you're good to go. So small that my wife has carried it in her bra. (Yeah, TMI. Sorry.) For guys, it makes a great pocket gun. It's hammer-fired, but has an incredibly good trigger on it. You have to try it to believe it. My wife picked up hers for just $200. At $200, it's almost an impulse purchase. Just found your blog and I'm loving it. Now I'm intrigued! Will definitely check it out! Thanks for the recommendation.